Delicious and easy to make, these Italian Style Meatballs will be your new favorite recipe. Add meat, breadcrumbs (or Keto substitute), eggs, salt, pepper, parsley, and cheese to a medium bowl. Mix well. Make larger than golf ball sized balls and keep them loosely packed. Toss them back and forth in your hands to help them form and keep them from packing to tightly. Place in a muffin tin for easier cooking, and turn them 15 minutes in to the 30 minute cook time. TIP: Replace the breadcrumbs with Panko or Almond Flour to make this recipe KETO friendly. The secret to cooking evenly is by LIGHTLY packing the meatballs. DOn't pack tightly or they will cook unevenly. 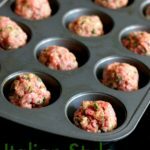 For easy cleanup, bake the meatballs in a muffin tin. For extra flavor, you can also grill these meatballs on the grill before adding them to any spaghetti or favorite dishes.